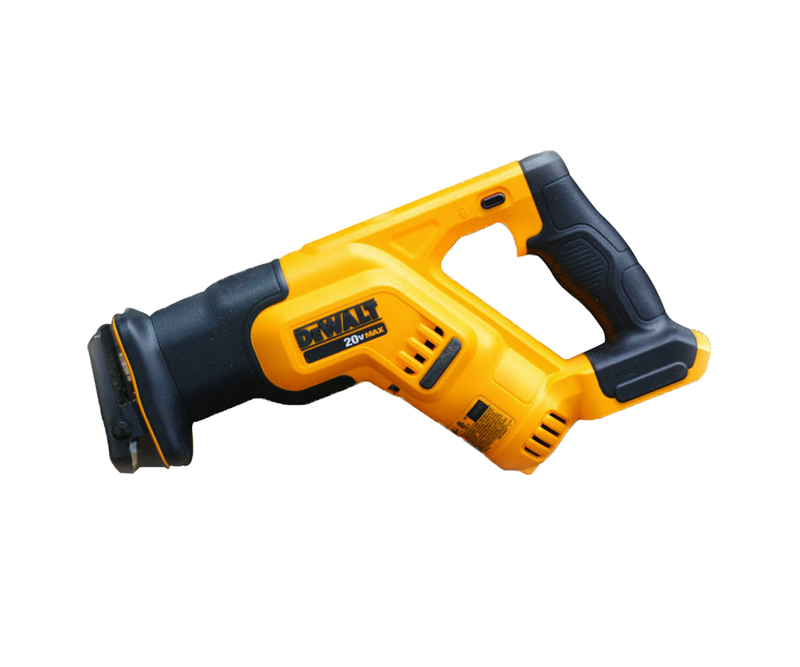 4 Whom is DEWALT DCS387B 20-volt MAX Compact Reciprocating Saw meant for? Are you looking for a compact and lightweight designed saw? Do you enjoy using highly advanced tools which ease work? 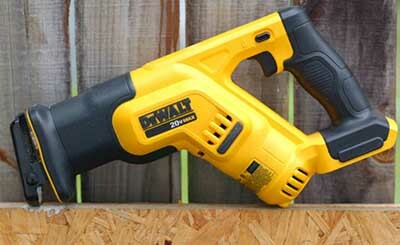 Then you will actually love what DEWALT DCS387B 20-volt MAX Compact Reciprocating Saw with Tool has to offer. Lightweight, compact and plenty of power. Balance is good enough to cut with one hand and led light is a great feature for keeping sight on your cut line. Not that you are making a precision cut with a reciprocating saw but still nice to have. Dewalt did a great job with this saw. 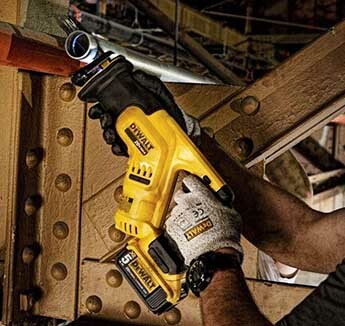 DEWALT DCS387B 20-volt MAX Compact Reciprocating Saw is probably one of the most popular and best reciprocating saws that are currently available in the market. 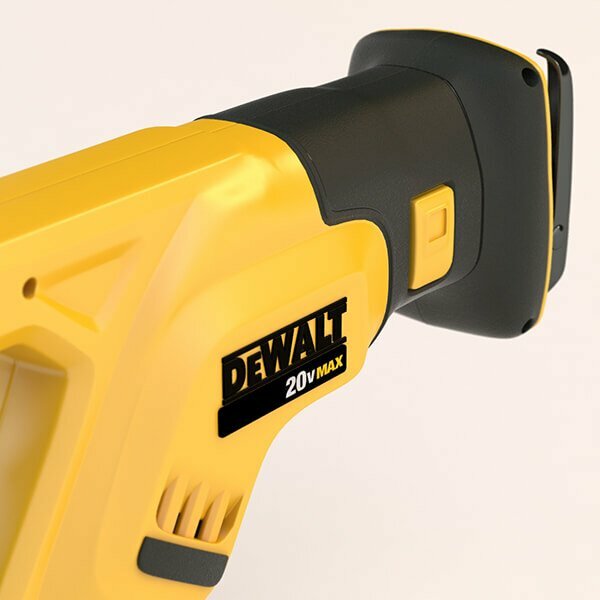 Whom is DEWALT DCS387B 20-volt MAX Compact Reciprocating Saw meant for? 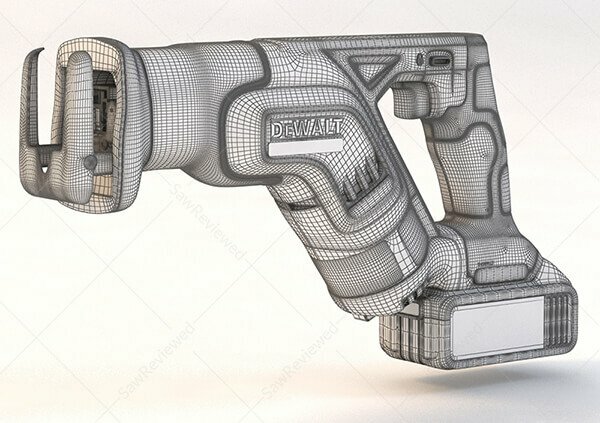 The Dewalt dcs387b reciprocating saw has been designed in such a way that the motor is located in the diagonal position on the front side of the trigger. It is just 14.5 inch in total length. It is considered to be one of lightest saw available in the market as it weighs only 4.9 pounds. The light built enables you to enjoy your job. The saw feels more comfortable in your hands when working in various situations while on ladders and scaffolding. It features an ergonomic soft grip handle which makes picking up the saw easier. You will actually like the experience. The handles will make you feel that your work only involves holding the saw in place. It will boost your efforts. Beside this, you will end up completing your work within the shortest time possible. While cutting a variety of situations, especially against the overheads and walls, the soft grip will provide you with more control power. 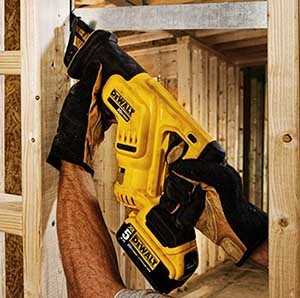 The 4 Position blade clamp makes the Dewalt dcs387b saw to be excellent for flush cutting. This feature also allows tool-free blade changes. Blade clamp release is located on the outside part of the upper handle so when you want to install the blade, it doesn’t matter where the clamp is. Blades can be installed in different orientations at 0, 90, 180 or 270 degrees relative to the handle or the trigger. This feature promotes safety. Users can easily make cuts even in confined spaces. It also contributes to increased positional versatility with the tool-free blade changes. The reciprocating saw goes where other types of saws cannot go. In addition to this, it offers better control than the other traditionally styled reciprocating saws does. Its capability to fit between studs provides the best solution for professionals who need a saw for tight situations. The short and compact design also enable you to work perfectly at the job places by enabling the ease of accessing tight places. 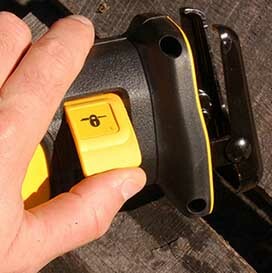 The variable speed trigger provides an increased blade control for precision cuts. The trigger is just big enough for one finger to operate effectively. While at work, you may at times experience that the trigger spring tension is a little bit tight. This helps in maintaining the speed controls if you are not undertaking the full throttle. The variable speed trigger also promotes the versatility of the reciprocating saw. The pivoting shoe which also offers an improved versatility when the saw is in operation. It comes with bright LED light at the front that provides better visibility for illuminating dark work areas and works even with the lock on. The blades can be mounted up, down, left or right side. This helps maintain the tool in a perfect configuration in those instances where users have to squeeze. It comes with a three-year limited warranty. The 1-1/8 Stroke Length offers a faster and impressive cutting speed and contributes to saving time and energy. Up-to-the moment of writing the excellent rating of 4.8 out of 5 stars after 77 customer reviews on Amazon. This shows that a huge percentage of customers are satisfied and happy with the general performance of this Compact Reciprocating saw. The customer reviews praise all the amazing features discussed above, including the powerful motor, LED light, the safety of use, heavy duty, the compact and lightweight nature, portability, its long battery life and more. A customer has shared his satisfaction by posting a review that outlines that this is a great tool for his tool box. Then he went on to say that it’s short body makes it easy to fit where it needs to. He says that there the vibration from the reciprocating saw is less and not destructive compared to other types of saws. The lights are placed in a perfect position and the variable trigger is easy to control. He concludes by saying that the reciprocating saw met all his expectations and he highly recommends it to all customers. Make sure you don’t have anything loose around the blade before you can hit the trigger. To promote safety, you can either use the tool-less blade mechanism or set the trigger lock mechanism and pull the battery. This is in order to ensure that there is no possible way it is going to move when the blade is being installed or when they are touched. This prevents any accidental engagements of the saw’s motor. Question: Which type of battery and charger is needed for this saw to start operation? 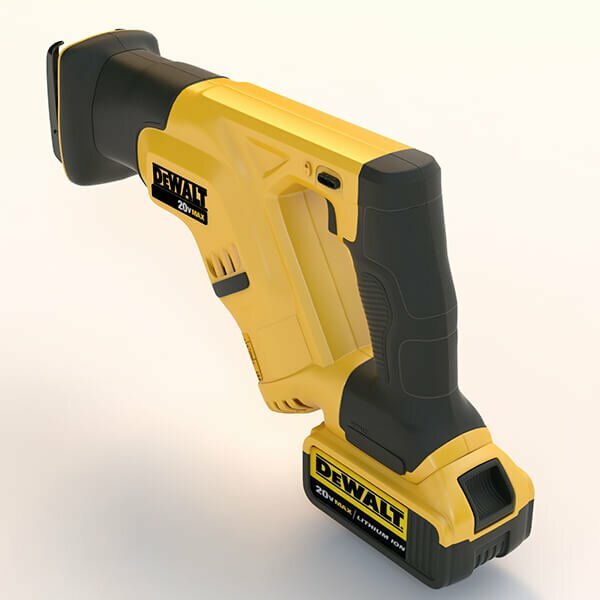 Answer: It is a 20Volt tool and therefore, any battery or charger in the 20Volt lineups will be effective. Question: Does it come with a case? Answer: No, it is a bare tool and comes with no case, charger or batteries. Question: Where can one get the case for this tool? Answer: You can use the soft Dewalt 18 inch tool bag which you can purchase at Amazon. It has a zipper and holds more than two tools. 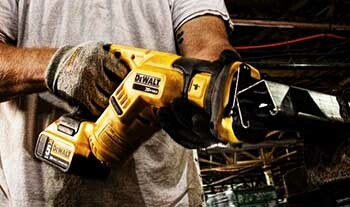 Technology is advancing at a faster rate and Dewalt dcs387b Reciprocating Saw is a proof of this fact. It is easy to perform various tasks within a very short time. This saw offers various benefits over other saws available in the market, such as in the fitting of corners and tight areas. Purchasing this reciprocating saw is your best way to start preparing yourself in undertaking heavy duties and tasks. Hurry and grab yours before they can run out of stock. Amazon is currently the best online retailers. Their products are offered all over the world. Anyone can easily place an order and receive products within the shortest period of time. They offer a variety of products at lower prices and their websites are considered to be more secure, safe and convenient for online shopping. This is the best online store to purchase the Dewalt dcs387b Reciprocating Saw. They have the best deals that you will never find at any other place. Buy DEWALT DCS387B 20-volt MAX Compact Reciprocating Saw with Tool On Amazon, Now!